CRAYS HILL, England - British police used sledgehammers, crowbars and a cherry picker Wednesday to clear the way for the eviction of Irish Travelers from a site where they have lived illegally for a decade. By the afternoon police said they were in control of the site, and that bailiffs were beginning to move onto the disputed property. Essex Police said two protesters were Tasered and seven people arrested after police officers were attacked with rocks, other missiles and liquids including urine. Residents and supporters, however, said police had used excessive force. Evictions of Travelers, a traditionally nomadic group similar to, but ethnically distinct from, Gypsy or Roma people, are relatively common across Britain. But few are as large, or as high-profile, as Wednesday's at Dale Farm. The police and bailiffs faced resistance from several dozen protesters who threw bricks and struggled with officers at the site, set in fields 30 miles east of London. One mobile home was set on fire as police moved in at dawn, and several protesters chained themselves to barricades with bicycle locks to slow down the evictions. Others scaled a 40-foot scaffolding tower. Police moved protesters away and later used a cherry picker, or mechanized lifting platform, to reach the scaffolding platform and remove protesters who had chained themselves to the structure. The conflict over Dale Farm has simmered since 2001, when Travelers bought and settled on a former scrap yard next to a legal Travelers' site. The legal battle dragged on for years until the Travelers lost a final appeal last week. The local authority says it's a simple planning issue  the 86 families lack permission to pitch homes on the land. The Travelers call it ethnic cleansing  the latest chapter in a centuries-old story of mistrust between nomads and British society. "I've been through a lot of evictions, but I've never seen anything like this ... they have come in and started a riot that we never wanted," said resident Kathleen McCarthy, who accused police of roughing up Travelers at the site, injuring three women. "We are being dragged out of the only homes we have in this world." Lily Hayes, who identified herself as a human rights observer, also accused the police of using unnecessary force. The ambulance service said one woman was taken to a hospital with minor back injuries. Five other people were treated for smoke inhalation, breathing difficulties and a nosebleed. 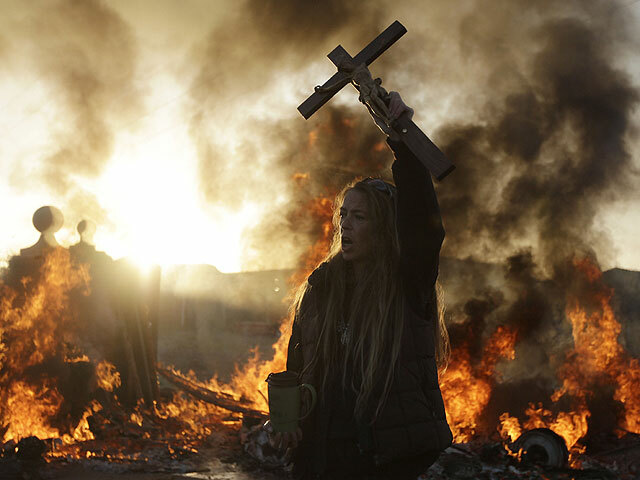 Authorities said the violence was coming not from residents but from their supporters  anarchists, environmentalists and anti-capitalists who came to the site from across Europe. "The premeditated and organized scenes of violence that we have already seen with protesters throwing rocks and bricks, threatening police with iron bars and setting fire to a caravan are shocking," said Tony Ball, leader of Basildon Council, the local authority. He said while "no one takes any satisfaction" in the police operation, he was confident that "after 10 years of negotiations to try and find a peaceful solution to this, that what we are doing is the right thing." There are an estimated 15,000 to 30,000 Irish Travelers in Britain, where they are recognized as a distinct ethnic minority. Oscar-winning actress and political activist Vanessa Redgrave came to the Dale Farm Travelers' support, and the U.N. Committee on the Elimination of Racial Discrimination urged authorities to find "a peaceful and appropriate solution" to the crisis.